We want to give you free supplies, too! Subscribe to Shaped, where educators and experts are shaping the future. Back in September, we posted about how we were jumping on the #10featuredteachers Instagram trend, alongside celebrities like Kristin Bell and Busy Philipps, and awarding 10 lucky educators Amazon.com gift cards. Well now we couldn’t be more thrilled to announce that our friends at Houghton Mifflin Harcourt (HMH) have offered to fund even more teachers’ wishlists! That’s right. We’re now giving 100 teachers each a $50 Amazon.com gift card when they share their classroom needs on Instagram or Twitter. To enter, all you have to do is take a picture and write a sentence or two about why we should pick you. Post it on Instagram or Twitter with the hashtags #10featuredteachers and #ShapeTheFuture. We’ll choose 100 of our favorites and send each of them a $50 Amazon.com gift card. Don’t forget to use both hashtags for the chance to get supplies. In honor of #GivingTuesday, we’ll choose the first 10 winners by Tuesday, November 27. Then we’ll select the final 90 winners by December 21, just in time for the holidays. For official rules, click here. 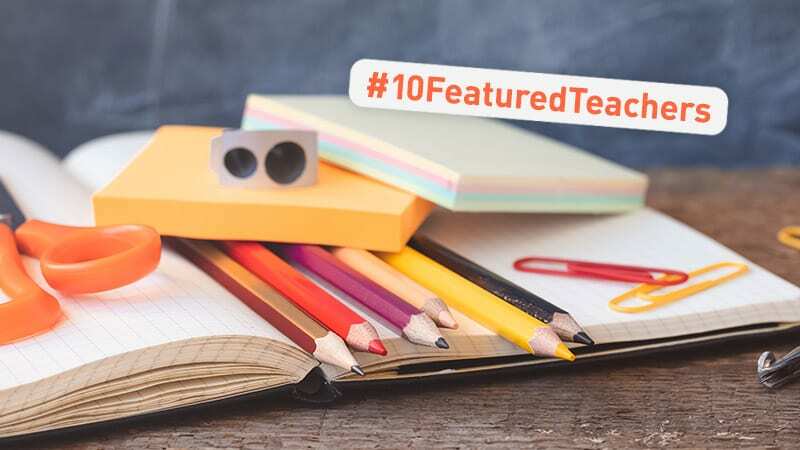 Wondering what the #10featuredteachers trend is all about? Earlier this year, celebs like Kristen Bell and Busy Philipps invited teachers to post their Amazon wish lists to Instagram. Then they randomly chose teachers to receive free supplies. Here’s Kristen’s invite to teachers. Busy gives credit to her friend Ed Droste, from the band Grizzly Bear, for starting the hashtag and awareness campaign to support public school teachers across the country. It’s such an amazing idea, and we all know how much teachers spend out of their own pockets on supplies (about $500 each year). Let us buy you supplies! We’re so looking forward to seeing your posts on Instagram and Twitter and showering 100 lucky teachers with Amazon.com gift cards. Remember to include both the #10featuredteachers hashtag and the #ShapeTheFuture hashtag on your post. Good luck and thank you, teachers, for all that you do. We know the hours can be long, and you’re not always recognized as much as you deserve. But what you do matters! Thanks for teaching our future generations.